I'm breaking custom with this post today. The focal point of this blog will not be about my students or about different classroom activities; it will be about the journey I have undergone this year. I have experience a number of changes this year: in instruction, in atmosphere, and in my connectedness. First and foremost, I would like to dispel the rumor that teachers have to plan once and reteach the same lesson year after year. After this year, I can concretely tell you that this is false. Yes, I reused some materials and lesson from last year, but by and large, I redeveloped my entire instructional delivery. Last year, I taught predominantly in whole group. I tried some small group, but got overwhelmed and stopped. I knew whole group wasn't the most effective way to teach, and I wasn't happy with that I had made an excuse. I decided over the summer to make some changes. I developed schedules, rotations, and activities to make it work more efficiently than my attempt last year. With procedures in place, it worked wonderfully! The students loved it and so did I. I taught reading and math entirely in small group format. It allowed me to target each groups' needs rather than "teaching to the middle." I plan to continue this next year, and to add some class flipping into the small group rotations, especially for science and history. Technology has always been my passion and I brought some technology into the classroom in my first year. However, I made it another goal to bring more purposeful tech integration to my classroom. This was another success. We used GAFE, green screens, Plickers, and many other technology components in useful ways. I would venture to say my students are among the most equipped in the school for working with technology in the entire building. The school environment also underwent a huge change. Some were positive, such as gaining a new fourth grade team member who meshed incredibly well with my closest colleague and me. On the other hand, everyone, myself included, just seemed "off" and agitated all year. We did not do so hot on our state assessments last year and were in danger of losing accreditation. The stress about the risk of losing accreditation was palpable. I will be honest that I stressed about it for a few months, until I realized it was one test on one day. I was not going to let it rule my life. I wanted to provide a world of wonder and learning for my students. From that point, I always led with "is this best for the students?" This had a large amount of positive effect on the students, because all students made considerable growth from third grade. I also took on more responsibilities this year than last; probably more than was wise to do. The HSCN experience was a large time commitment, but one that I feel was crucial. In addition to all of the responsibilities related to my full-time teaching job, I am enrolled in graduate school full time, was a cross country coach part time, and served on an autism services improvement team and a Google Educator consortium. This effectively meant I had little to no time to recharge during the week and had to leave my classroom every few weeks for meetings. It certainly wasn't easy keeping up with everything, but it was definitely worth it. It did come at a personal cost of being more highly stressed, but in the end it benefitted the students. Probably the change that restored my sanity was becoming a connected educator. I had blogged on this at length earlier this year, but I continue to learn new things from my Twitter/Voxer PLN every day. These include wonderful members such as Rosy Burke, Mari Venturino, Greg Bagby, Stacey Lindes, Connie Hamilton, Mark French, Mark Bartmas, Richard Hattal, Kayla Delzer, and many other outstanding educators who I connect with on a daily basis. Becoming a connected educator has led me to many different viewpoints. Rather than having a handful of colleagues at my school, I literally have over 1,000 people I can reach out to at the touch of a button. I hope that my Tweets, Voxes, and blog posts help to inspire others as much as I have been inspired by them. This has also led to different opportunities that wouldn't have otherwise been possible. Connie Hamilton nominated me for a Bammy Award for Elementary Teacher of the Year and I was featured on a few different websites, shows, and podcasts: Dr. Geniene Delahunty's Human Beacon, TeachCow Teacher Talk Live, Sung Lee's Inspiring Educator Podcast, among others. This is not meant as a bragging moment for me; it just shows how reaching out can get your message out to the masses. Hopefully, by what has been said and written about me, I can help other teachers reach the maximum level of effectiveness. can focus on my classroom more. My graduate degree should be completed by September. I will continue to grow as a teacher and a learner. One goal I have is to help others more effectively integrate technology into their classroom. I applied for a job as a technology coach, but was denied an interview. This will not deter me. I plan to set up "Technology Tuesdays," (an idea I got from Chris Nesi's podcast) where teachers would be invited to join me in my classroom for 15 minutes in order to learn a "tech tip they can learn today and use tomorrow." I think this will be a great way to slowly introduce tech to teachers. I'll continue offering more traditionally technology professional development as well, which will serve as the focus for another blog later this summer. I will also be starting the EduRoadTrip podcast this summer with two members of my PLN. This podcast will be a great way to celebrate education in a fun and engaging way. 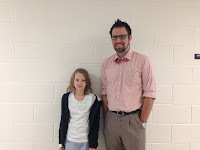 Social media will continue to play a key role in my growth, and I aim to use Twitter and Voxer in the classroom more. "[Mr. B] was fun about our learning and didn't just put worksheets in our face he took his time out of his free time to make fun things for use. He mixes math with VA Studies. He makes us laugh." How was your 2014-15? What were some of your successes? What are some goals for next year? "Welcome to Readers Cafe. We have amazing readers waiting to read to you and awesome snacks too. We hope you have a wonderful time. May I show you to your seat, sir?" "Eating and reading are two pleasures that combine admirably"
The opening of the restaurant is the final goal, but as is often the case with learning, it's more about the destination. I cannot take full credit for Readers Cafe; it is a concept that I adapted from the student teaching cooperating teacher. Due to state testing butting up to the second to last day of school last year, I wasn't able to do it then. However, this year we had two weeks between state testing being done and end of school year. As soon as I realized this, I approached my principal about doing it this year. She had remembered it from my original interview and agreed. She also agreed to fund the supplies and food needed! Before even thinking about opening up the Cafe, the students had a lot of work to do. I partnered them up, trying to build new friendships and keeping reading levels heterogeneously mixed. From there, each partnership chose three picture books. I told them that all three books should last no less than twenty minutes together, but there would be no maximum time. For a few days, we practiced just reading the books, focusing on fluency, pronunciation, and expression. The next step was to develop comprehension questions about the story. Questioning is a great way to develop higher level thinking skills. I instructed and modeled beginning prediction questions, one literal and one inferential question each for the middle, and one summarizing/evaluating question for the end, for a total of twelve questions. The only requirement was that the questions couldn't be answered with a simple yes or no. On Google Classroom, I shared a matrix so they could type in their questions. After developing questions, the students continued working on their fluency and practiced asking the questions. Host - Greets the customers, shows them to their seats, keeps track of time, and dismisses the customers. Waiter - Takes the orders from the customers to the chefs and brings it back. They also help in dismissing the customers. Chef - Fills the orders (goldfish, pretzels, and animal crackers) when the waiters bring it to them. They are also responsible for making sure the food bowls stay filled. Bus Person - Clears the plates after the customers have eaten, washes the dishes, and returns it to the chefs. They also fill in if a host or waiter is absent. After detailing the jobs, the students picked what jobs they wanted. Amazingly, every student got their first or second choice. I also told them they had to develop their own systems for their jobs. The hosts developed this opening and closing and which sections they would be seating, the waiters developed this waiter pad and which sections they served, and the chefs and bus people determined who would be in charge of which snacks and sections, respectively. I had twenty two students this year. This means that while eleven of the students (one student from each partnership) were reading , the other eleven (the other student from the partnership) had jobs. We alternated between round one and round two. When they finished their job, they would read quietly or assist other students. Finally, we were ready to practice everything together: the books, the questions, and the jobs. We used two of my close friends' classes for this and it helped us to highlight weaknesses and strengths. A big strength we noticed was that the systems worked wonderfully. The biggest challenge was keeping the customers focused on the reader. We implemented a "tap the desk, say their name, ask a question, get Mr. B" system to help manage the attention. During the real event, I never had to step in to help get a customer under control. It was amazing to see them solve inattentiveness issues and hopefully it gives them an higher appreciation for teachers! Our final practice round was with the families. The Friday before the school-wide event, I invited the families to drop in at any point at the end of the day. We had to make a modified schedule to account for this, but it was clear we had all systems down pat. I even asked the parents to get off task to test how our "tap, name, question" system worked. About two weeks before the school-wide event, I sent out a Google Form with a reservation form to the staff in the building. I used a really awesome add-on called Choice Eliminator that make it easy to make sure no one was double booked. It worked pretty well, aside from two minor issues. I also invited the Assistant Superintendents and other members of the School Board Office to attend at any time during the three days. We ended up having seven join us! Monday came and Readers Cafe began. We had decorated with a patriotic theme, including red, white, and blue leis for the customers, flag print tablecloths, and other adornments. Each class was given twenty minutes to be seated, served, read to, and lined back up, and we had five minutes in between to switch rounds. Truth be told, aside from announcing which round we were doing, I basically sat there and did nothing. The students ran it all, from seating to serving to clearing to dismissing. The teachers had a choice of being sat in my comfortable recliner or with a reader. Many started on the recliner, but ended up inching closer to the nearest desk! The feedback I received from the customers was great! The students seemed to enjoy the books and the snack, the teachers said it was a cute and awesome experience and commented on the outstanding fluency and expression, and the School Board thought it was a great way to end the year. I saw a lot of great things: critical thinking questions, improvements in fluency, leadership roles, problem solving, and hard work. My students loved feeling in charge of the Cafe and I loved seeing them take ownership of it. My students begged me to do it again next year, so they can attend it as a customer! Now that you've read this post, check out what we updated in 2017 here. You can watch a video overview of Readers Cafe above. UPDATE: After reading this piece, please check out the second posts in this series: "Genius Hour: An Update." In modern-day education, choice is not often relegated to the students (or the teacher in some cases.) But what if choice about what was learned was given to the students? Would they be more engaged and take accountability in their learning? Or would they run amok? After engaging in a Twitter chat in mid-March, I learned about the concept of Genius Hour. For those of you who have never heard of this, it is based on Google's 20% Time, wherein employees are to use part of their work week on a passion project. This has become a major movement in education. I decided to give it a whirl. After selecting the last hour of the day on Wednesdays, my class and I launched into the process. The first day they brainstormed topics. I told them that it could be anything that was school appropriate. "Mr. B, does it have to relate to Virginia Studies?" I was asked. "Nope! It can be anything you want to learn more about." I also dropped a mind bomb on them - this project would not be graded. I asked them if it should change their effort level, and thankfully they said no. The students put two potential topics into a Google Form and I approved one of them. Topics ranged from Civil War battles, to pyramids, to sports, to Kid President, to science and animals, and many more. One student even chose me as her topic! The students came up with expectations 2-4, and I insisted on number 1. I felt they would maximize their time best if they had objectives to meet each day. They set their own objectives and adjusted accordingly. We set up a rudimentary notetaking system: the notecards needed the website they found it from, the date, and the words summarized in their own words. This effectively acts as a lead in to later research projects in middle and high school. We allotted a few weeks for research, a few for project building, and a few for presentations. As the year progressed and our state testing began, we had to tweak the schedule. All the presentations were condensed into one day rather than three days, but we still had plenty of time. The students loved Genius Hour! They often asked me if they could work on it in free time (yes!) and at home (absolutely!) Wednesday afternoons were held sacred; it was a travesty if we had to cancel for some reason. The students came up with various different projects. The most popular one was a Google Presentation. Students worked with each other to edit the text and format their designs. One student added in transition effects between slides, which I had not even taught him to do. I was very impressed with his drive to find more about Drive. Aside from Presentations, some students made dioramas/models. The students completed these both in class and at home, and created some incredible models! 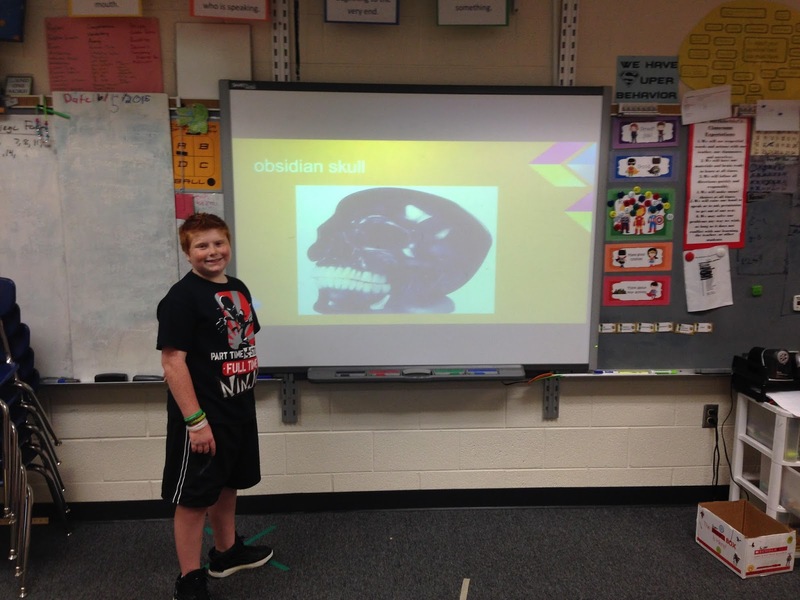 Other students made traditional posters and some simply read an oral report to the class. No one project style was the same, nor was any one better than the other. The wide variety of choice allowed all students to shine. On presentation day, I went in "volunteer order." Amazingly, all but four students voluntarily presented before I had to start flipping coins for the next group. This is a huge shift for our class, who didn't start out as completely comfortable presenting in front of each other. 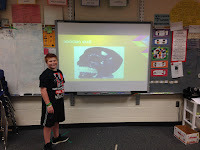 Students seemed to enjoy running the SmartBoard and presenting their new found genius. Many students presented without a script, which was impressive in and of itself. You can watch all of their presentations to the left. and wanted to learn more." That is the kind of attitude I want to foster in all my students. Have some background knowledge and the desire to expand upon it. This innate love for learning and curiosity will serve them well in life, more so than any test or mandated curriculum will. Have you ever tried Genius Hour? If so, what were your major takeaways? If not, what's stopping you?